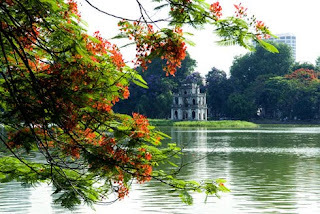 Hoan Kiem Lake is considered the pearl of the capital city, as tourists or foreigners called “flower basket in the heart of the city” located in the heart of Hanoi. Although the temple is a complete new architecture but Ngoc Son temple is a typical space and architectural artifacts. According to scientists they are a residual of the Red River after the river had moved the line as at present. The variability of the river he took a few thousand years ago. Formerly called Luc Thuy Lake has excellent water for four seasons green. 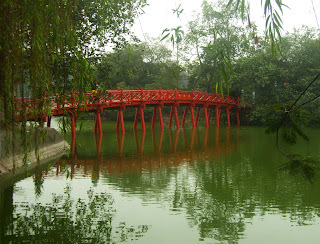 15th century, Luc Thuy lake was named Hoan Kiem lake. Hoan Kiem name associated with the story paid sword for gold turtles of King Le Thai To. Ngoc Son island ancient statue known as Tuong Nhi (elephant ears), King Ly Thai To moved his capital to Thang Long named Ngoc Tuong, to Tran dynasty renamed Ngoc Son. Here was erected a temple to worship the heroic martyrs who sacrificed during the resistance war against the Nguyen Mong. Later he collapsed house long, up to the Vinh Huu life – Le dynasty (1735 – 1739), lord Trinh Giang built Thuy Khanh and also covering up the 2 mountain land on the east coast facing the Ngoc Son called Dao Tai and Ngoc Boi mountain. End of Le dynasty, along with Thuy Khanh palace was destroyed by Le Chieu Thong. A charity named Tin Trai, on the same old base have established a temple called Ngoc Son pagoda. In third Thieu Tri dynasty (1843), the pagoda gave up for a charity renamed Tam Thanh temple. The society was removed steeple, rebuilt main palace, the two sides suites, bringing Van Xuong De Quan statue to worship and renamed Ngoc Son temple (Van Xuong the character Kien Vu dynasty, 25-55 after the cause the Chinese, the death was made a client of the scientific literature ) According to ” Ha Thanh books ” is from Le dynasty on the island, in Ngoc Son Temple had worship Quan Cong, celebrity high life that the Three Kingdoms (China). When King Le and Trinh Lord use lake where hydraulic forces are considered as a martial arts temple shrines. 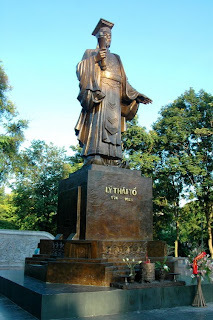 Ha thanh people has brought Duc Thanh Tran statue worship combine with Quan Cong. But “Kham dinh Viet su thong giam cuong muc” for that is the Le Lai statue, the national spirit birth on Le dynasty was discharged body savior. In Tu Duc first eighteen years (1865), Nguyen Van Sieu confucian scholar repaired the temple. At each change covering more land and build stone embankment around, built Tran Ba communal house, a bridge from the north east coast to the bridge called The Huc. 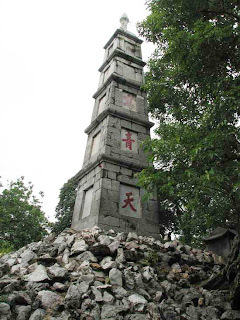 Mountain Ngoc Boi old, he built a stone tower, brush tops the summit tower, the tower itself had carved three words “Ta Thanh Thien” (mean: write on blue sky), today commonly called the Tower Pen. Next door is a book called the inkstone estrade, is placed a stone the ink slab halt peach duo vertically, with the team three frogs. In inkstone has engraved a article about the use ink slab philosophical aspects. People born after praise is “Nhat Dai Phuong Dinh But”. From port outside the walls into two sides, one side of the table dragon, a tiger inside a table, the table represents the noble named the test passed, makes the artist as try to go through e-education . The Huc bridge name that is retained beautiful light of the sun. 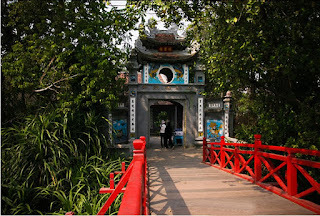 The Huc bridge leading to Ngoc Son Temple Gate, also known as Dac Nguyet Lau (floor see moon) under the shade tree with the collection, the trees in the middle of a thickset, like emergence from the water. Temple of connecting together two throne, the first temple to the North was worship Van Xuong and Tran Hung Dao. Van Xuong statue standing, holding a pen is placed in the harem of about 1 meter high stone pedestal, the two sides have two stone stairs. The south has Tran Ba communal house (home-sure waves implies pillar withstand the wave of unfair in contemporary culture). Home eight square roof, roof two floors with 8 column prop, four out of stone columns, four columns of wood. Characters in the temple outside the church down to Van Quan De Vuong, La Dong Tan, Quan Van Truong, Tran Hung Dao, also worship the Buddha Amitabha. 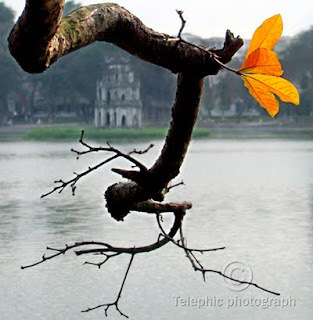 This represents the concept of three traditional religion in Vietnam (Buddhism, Taoism and Confucianism). The combination of Ngoc Son temple and Hoan Kiem lake has created an overall architecture God – Human merge, creating the ancient beauty, harmony, balanced to the temple and the lake, should suggest the feeling among the people and nature. Temples and lakes have become certified area recall the memories of the old national history, awakening pride, patriotism legitimate, as well as spiritual, a sense of Vietnam before immortal ethnic . 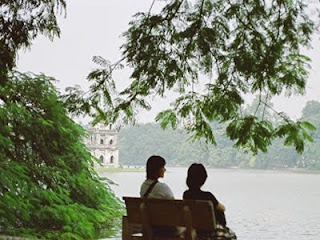 For Hanoi people, Hoan Kiem Lake is a place to get some fresh air, a place to play boats but also associated with life in many ways: Eve, many people enjoy the spring walk around the lake. Spring, the lake is a meeting place for good men to women credit ceremony temples nearby. The couple married the day to find the sword lake souvenir photograph. The summer, the muggy afternoon, the lake is an ideal location to get some fresh air. Who had once looked into the lake from above will not fitful before color paintings and poetry of the violet insult trees alternating between red flamboyant trees, golden rice cooled trees, the big trees ferment down, the arms embracing green in color turquoise water specifically. Autumn, Hoan Kiem lake is not only beautiful landscapes with ranges pendulous willow shores, sun sparkling on the water but also the capital where people comes to see the fireworks of the great festival of the people groups as 2-9 (Independent day) and 19-8. The historical uniqueness: Turtle Tower, the King Ly Thai To statue, Ngoc Son Temple, Nghien estrade , Pen tower, Ba Kieu temples, Ba Da pagodas … architecture and modern, newly built or created but always ensure harmonious combination with the inherent landscape around the lake. 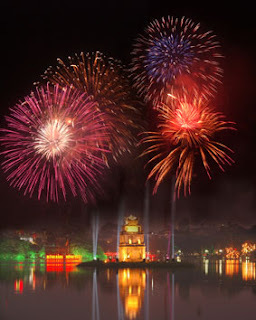 Hoan Kiem Lake with Ngoc Son temple, The Huc bridge and Turtle Tower sparkling water balloon is the image of the capital Hanoi in a heart of Vietnam.